I started out with this yarn thinking I was going to make Diamond Waffle socks, but the yarn is variegated and didn’t look good with the pattern. So I decided to use the cable pattern from the Mock Wave Cable socks in Favorite Socks. That is a top-down pattern, but it seemed like the pattern would work toe-up also. So these socks are sort of a combination of the two patterns. Tried KnitPicks rosewood circulars to start this, they were too grabby with the yarn. Switched to the nickel plated ones. Can’t figure out the “lighter circular beginning” cast-on to save my life, so did Judy’s magic cast-on instead. I have thick insteps and ankles so I switched from size small to size medium at the point where the increases started. 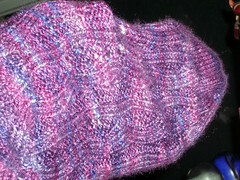 After turning the heel, I switched from size 0 to size 1 needles. The 2-ply merino superwash yarn is nice to work with. It produces pretty, subtle color changes and a thick yummy fabric when ribbed. It also blooms sweetly when washed.